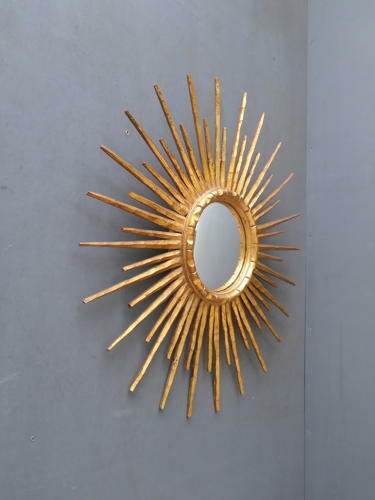 A beautiful example of a large vintage gilt wood sunburst mirror. A wonderful mirror featuring the original convex mirror plate set in beautifully carved wooden frame with delicate sun rays & subtle beading surrounding the mirror itself. The original finish incorporating an red oxide undercoat & gilt top coat combine beautifully & the convex mirror plate reflects a large area. Excellent unrestored condition, tear to the brown paper covering to the rear..